Do you have a signature newborn baby gift that you always give? Or gifts you’ve received that were just so thoughtful and unique? 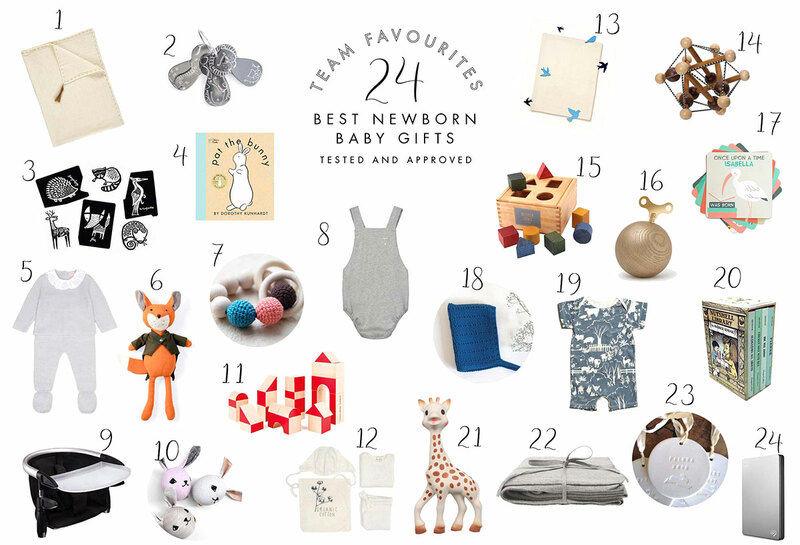 That newborn baby time is so special — a time for fun and thoughtful gift giving, so we have curated our two dozen favourite gift ideas to share with you. With ideas that range from soft and cuddly, to useful, long lasting, practical, handcrafted, clever, memorable, and heirloom worthy. These are gifts that we love, and are winners! We hope our ideas will inspire your gifting ideas. And, of course, we would love to hear what your favourite gifts to give (and get!) for newborns are, too. ps The little photos are of my sleepy 3 month old, (taken almost a year ago!) playing with one of our favourite newborn baby gifts we received which was a brilliant gift. It is a wooden Heimess play set, and was actually a newborn gift for his sister, but has been a treasured item with both children for the first year of their lives. 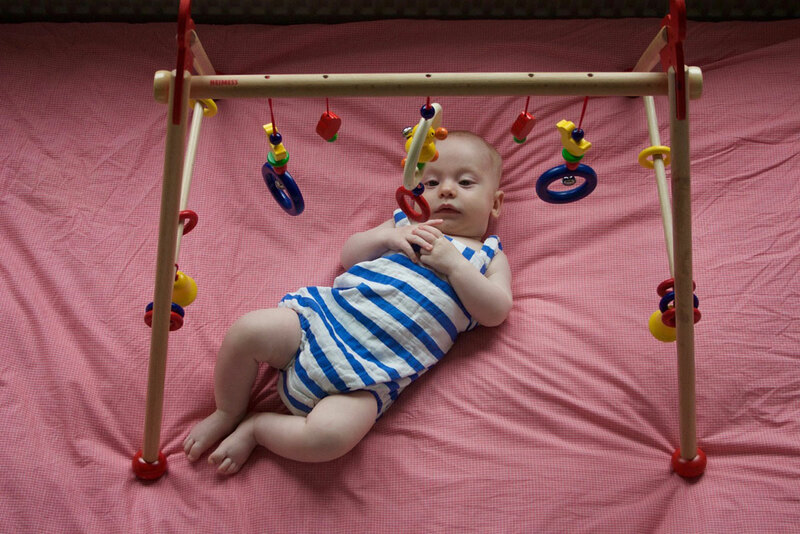 The shapes, colours, and little dinging bell entertain the smallest newborn and it is so portable we could easily change rooms with it and use it on the sofa / floor / bed / outdoor picnic blanket. Then as the baby grows they begin to grasp at the rings and bells, soon engaging with it, sitting up under it, and eventually supporting them as a walker. It’s design is ideal, not only is the height adaptable as they grow, it fortunately is also easy to store away but simply twisting the wooden rods and storing it in a small space. Ideal as a gift that last the entire first year and also looks beautiful in a home. A great gift indeed! I was fortunate to receive many carefully considered, keepsake, well-designed gifts when my son was born. However, the standout gift that has lasted the test of time are the Ikea ‘Mula’ building beakers at a bargain £1.50. Still played with, at age 6, every bath-time, whilst the more sophisticated bath toys and various bits of Playmobil and lego come and go. An unexpectedly sophisticated design, that works on many levels (tactile, different colours, stack and nest, different perforations for different effects, can make rockets, light houses, faces etc., use in the dry, in the bath, on the beach at the sand pit etc.). They used to be £1 and nicer primary colours though! We also have had the same stacking cups next to our bath for nearly 12 years! And still played with. Handy to rinse out hair, too! !